Join us in March for Wisconsin’s largest Saint Patrick’s Day Parade along with an Irish Fest in downtown New London, Wisconsin. The legendary week of festivities begin when local Shamrock Club leprechauns change the town’s name to ‘New Dublin’. 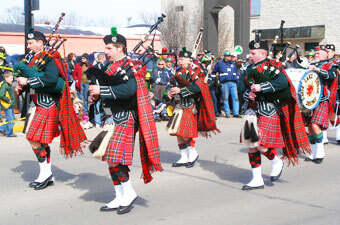 The Grand Parade typically has an extensive lineup of bagpipe bands, marching bands, festive clowns, specialty units, clans, an Irish wake parody, and business floats–up to 125 units or more. Bring the whole family to watch this nationally recognized event! 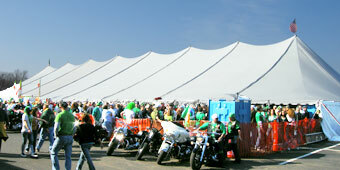 Irish Fest is a music festival held under a huge heated big top that each year features three dynamic Celtic bands. Enjoy Irish food, beverages, and browse market booths. St. Patrick’s Day in New Dublin is a week-long celebration that includes an exciting schedule of weeknight activities. They include; Irish caroling, Irish entertainment on stage, and an Irish Céili. Corned beef and cabbage is widely served during the week in area restaurants and pubs with some places usually having entertainment. Find more things to do in the New London Tourism Guide to enhance your visit or come back and enjoy leisure activities when New Dublin goes back to being New London. In the summer three rivers make the area a natural waterpark for river tubing, canoeing, and kayaking opportunities.